- Publisher Know why you believe. Pass on what you've experienced. Many Christians are unsure about what they believe and why. They may wonder if their faith is meaningful and credible. Because of this, they struggle with passing on a relevant Christianity to their families and friends. That's why Josh McDowell and his son, Sean, have created this comprehensive yet easy-to-understand handbook. Unpacking 12 biblical truths that define the core of Christian belief, the McDowells help you discover: - the foundational truths about God, his Word, sin, Christ, the Trinity, the church, and six more that form the bedrock of Christian faith - compelling evidence to support these truths - how each truth provides relevant answers to the world's most difficult problems and gives a sense of joy and meaning to every true believer - how you can live out these truths in relationship with God and others - ways to pass each truth on to your family. and the world around you Biblically grounded, spiritually deep, theologically extensive, and packed with practical examples and real-life stories, "The Unshakable Truth" is a resource applicable to every aspect of everyday life...a resource you'll turn to again and again. Know why you believe. Pass on what you've experienced. Many Christians are unsure about what they believe and why. They may wonder if their faith is meaningful and credible. Because of this, they struggle with passing on a relevant Christianity to their families and friends. That's why Josh McDowell and his son, Sean, have created this comprehensive yet easy-to-understand handbook. Unpacking 12 biblical truths that define the core of Christian belief, the McDowells help you discover: - the foundational truths about God, his Word, sin, Christ, the Trinity, the church, and six more that form the bedrock of Christian faith - compelling evidence to support these truths - how each truth provides relevant answers to the world's most difficult problems and gives a sense of joy and meaning to every true believer - how you can live out these truths in relationship with God and others - ways to pass each truth on to your family. 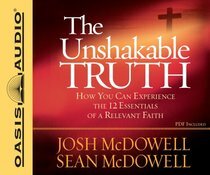 and the world around you Biblically grounded, spiritually deep, theologically extensive, and packed with practical examples and real-life stories, "The Unshakable Truth" is a resource applicable to every aspect of everyday life...a resource you'll turn to again and again.